“…. I Experienced a Shift — And You Will, Too! 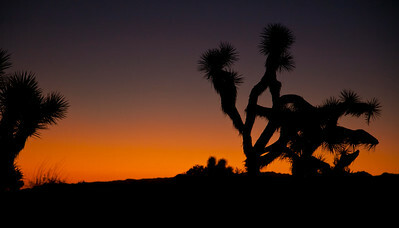 It is no secret that the Joshua Tree Retreat Center is a special place. I have blogged about it often. Most people that I talk to do not realize that the center is open for personal retreats. I thought I would re-post an article from the Executive Director, Victoria Jennings in which she describes her personal experiences and some of the history of the 400 acre center. In 1941, dingle was driving down a lone desert road in search of a suitable site, when he suddenly felt compelled to pull over to the side of a barren road. In that moment, a burst of light came down from the heavens. As its rays poured over the landscape, he heard a voice say, “The desert will bloom like a rose … someday there shall be cities built around the land. Great highways shall lead here as a place of respite.” Dingle soon brought this vision to reality—building began on the site in 1948. From its beginnings, this land has been an energy vortex immersed in a protective aura. Ding Le Mei, as Dingle became known, taught a mixture of meditation, pranayama >(breath work), affirmations and other spiritual practices that lead to balance of body, mind and spirit. His philosophy of MentalPhysics is based on the way the mind creates the physical world and it would eventually make its way to over 220,000 students worldwide. 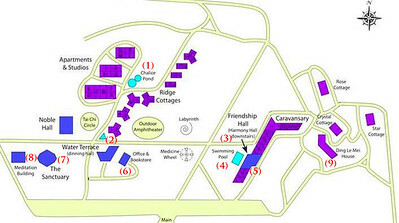 The property has changed substantially since Dingle was first guided here. For starters, there are several beautiful buildings reminiscent of Frank Lloyd Wright’s Taliesin. Dingle had a relationship with Wright, albeit a rocky one. Perhaps their biggest obstacle was philosophical perspective. For Dingle, the layout of the buildings on leylines (lines of energy within the earth) furthered a connection to the land and the Buddhist designs he admired. But the Vastu (a building philosophy similar to Feng Shui) Dingle had learned was foreign to the architect at that time. Wright ultimately passed the job on to his son, Lloyd Wright, a less-recognized master in his own right. 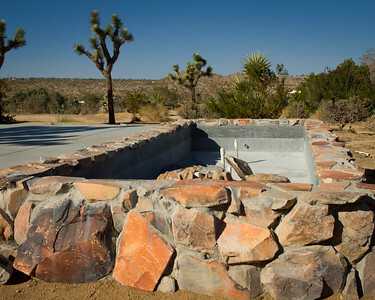 They’ve Struck Water at the Joshua Tree Retreat Center! 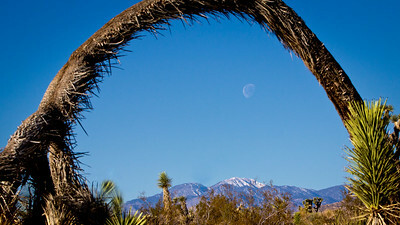 There was never a reason not to visit the Joshua Tree Retreat Center (JTRC). And the architecture by Lloyd Wright, the quiet of the Mojave Desert, the self-realization nature of the curricula and more make a bouquet of reasons to visit this special place located on Hwy 62 in the California Desert. Now they’ve discovered hot springs! Although yet to be developed, this post describes what is available now. For those of us who gravitate to the lake or sea, we might be thinking that we would miss the water — but no more! Since I have been visiting here, it has become more lush. So with a couple of days on my own, I decided to take a photographic inventory of the water features at JTRC. It’s 7am on a crisp late October morning. I get up and in my quest for coffee at the Dining Hall; I pass the Chalice Pond. Constructed in 2009, this was the first of a major undertaking of the new water projects conceived by the Director here, Victoria GeVoian. The sun is behind the fountain to the East, and is just beginning to hit the upper jet. The Chalice Pond is located between the Apartments and Studios and the Ridge-line Cottages (See map near the end of this post). The image that I am thinking about was done for a school that holds classes here. I arranged some of the staff and students around this triangular-shaped fountain. It was a magical moment. Everyone took my direction, and continued to interact as they had before I had guided them into position — so the moment was “real.” I had a Quantum Q flash ready to fill-in the shadows of the strong desert sun and was ready to release the shutter. Suddenly, a passer-by ran into frame claiming, “hey, what are you guys doing here taking this picture? — pictures should not be posed, posed pictures not real!” (My dear mentor, the late Monte Zucker is smiling now). I clicked the shutter, and she was the only thing in the shot that appeared out-of-place. She was later “Shopped” from the image. The actual image made was picked-up be the school catalog. There are coy in this pond, and it is a meeting place for the people who attend events here. It’s a great place to sit and not be too far from the coffee! Doing an about-face will give you this view of the dining facilities. The facilities are really quite special — designed with a high, peaked ceiling and picture windows. The Caravansary rooms have a special spot in my heart. Maybe because it was where I stayed during my first visit here over five years ago. Or, maybe it’s because it is where I met several close friends like Jim Dewell and where I first saw Brooke Medicine Eagle. There was no fountain at the Caravansary then; perhaps the Director, Victoria had it in-the-works. But at that time it was just desert. The Caravansary Fountain may not be as active as the Chalice Pond, or as serene as the Dining Hall Fountain, but I think this one is my favorites. I think this is partially because it reflects the shape of Lloyd Wright’s architectural details on the roof-line of the Caravansary just beyond. Directly behind this location, adjacent to Friendship Hall, are the new pool and spa. I am told that there are still some landscaping plans in-the-works, but the pool and spa are heated operational. At the time that I made this image, there as a German photographer doing laps at about 9 in the morning. He was being observed or accompanied by the mysterious, hatted figure seen in the shadows of the foreground. I thought that I had finished the inventory of water features and fountains when I remembered a large pot by the Friendship Hall. I drove (yes, I know, a purist would have walked) over to the area adjacent to the caravancias and grabbed this quick image of the Friendship Hall Fountain. 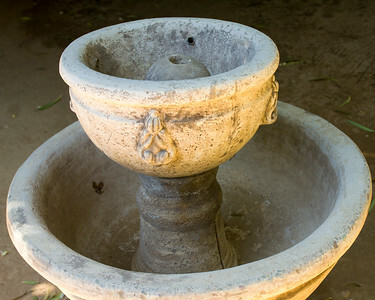 Of course, by now I should have known that there would be a fountain at the Sanctuary. The sound from this one echoes off of the stone walls of the Sanctuary building onto the quadrangle. I am informed that the proper Fung Shui for this fountain is just right where it is: on the “dragon-side” of the building. Quiet, secluded and peaceful, the Meditation Building is directly behind (to the West) the Sanctuary. Here, a quiet fountain is watched-over by a goddess (at the time of this writing, I believe it is one of the Taras). Silence is encouraged here. If you ask about the figures in silhouette in the image above, I am afraid that I just couldn’t say, other than to mention that my assistants often wear hats. I have photographed the house of the founder of the Institute of Mental Physics (yes, it is a name that can be an ice-breaker) before. For background on the center and the founder, I invite the reader to visit the Institute of Mental Physics website. I walked (this time) over to the Ding Le Mei House to scout the pool. The next day, I returned to make this image with the help of Regina, my daughter-in-law. Oh, did I mention the gift shop itself? One of the best-stocked New Age gift shops that I have seen is here. I just couldn’t help picking up a rattle made from nut shells! In this image, the pendulae in the center are moved by the breeze coming in from the front door — or are they? Photographers always encourage each other to have personal projects. I made use of some personal time in the desert to do this one — for myself, and for my friends at the Joshua Tree Retreat Center. I hope you like it. After reviewing this blog post, Victoria informed me that I had missed one. I said, “you mean that one that is in pieces next to Noble Hall?” “No! The one on the exercise pad next to Noble Hall.” “So, I missed two!” I include these for the sake of completeness.